Karen House : Feb. 7, 2019, 1:21 p.m.
Feb. 7, 2019 – An attempted traffic stop led to a foot pursuit on Signal Mountain during the early morning hours today. 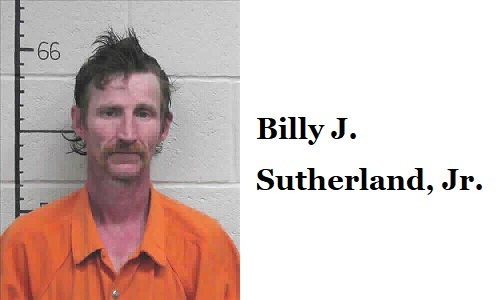 The Sequatchie County Sheriff's Office (SCSO) arrested Billy J. Sutherland, Jr., and charged him with aggravated assault, resisting arrest, evading arrest, and unlawful possession of a firearm after he reportedly fought a deputy trying to detain him. Detective Jason Harvey said today that Deputy Aaron Cameron attempted to pull over a black sedan on Handley Road at 3:18 a.m., but when he turned on his blue lights, the car began to speed up. When the car reached a dead end, the driver left the car and fled on foot with the deputy in pursuit. Dep. Cameron reportedly tased the suspect and placed him in custody, recovering a 9mm pistol from Sutherland's jacket pocket. Sutherland is 48 years old, and a resident of Signal Mountain. Although he has a criminal history in Sequatchie County, there were no current warrants for his arrest and no illegal substances were found in his vehicle, Harvey said. Sutherland was transported to the Sequatchie County Jail, where he is being held on open court bond until his initial court appearance on Feb. 15.